Author and researcher Mr. Konstantinos Kirimis, from Greece, has conducted extensive and systematic investigation and on site exploration of WW2 bunkers and other fortifications. Author and researcher Mr. Konstantinos Kirimis standing in front of one of the “Navy Type” steel armored doors at the Fleves Bunker Complex. One such bunker and artillery positions complex, located at Fleves island, still survives to this day, reminding us of the turbulent times during World War II. The red lines indicate the steel doors, the pink square the hydraulic installation, the inverted brackets are the steel stairs, while the concrete staircases are the striped rectangles. The green lines are the projectile mechanism installations, while the Greek alphabet letters indicate the various bunker entrances and sizes. Designed and constructed by the Royal Hellenic Navy prior to the outbreak of WW2, it was then used by the Germans, after the capitulation of Greece. The Royal Hellenic Navy Fortress on Fleves island consisted of four 178 mm guns, located on a hillside, in the middle of the island. The guns were removed from the decommissioned battleship “Lemnos” and were positioned on large concrete foundations, with a diameter of 9 meters each. While we can still observe these foundations, which survive to this day, we can hardly imagine that these foundations are just the… “tip of an iceberg”, as underneath them, an impressive and largely untouched bunker complex lays hidden. “The entrance to each bunker is via a 4 meters long concrete staircase. Through the steel armored door, we enter the anteroom (2 x 2 m). The concrete foundation of one of the 178 mm guns at the left. The concrete staircase to the bunker complex is at right. “The main bunker is of a rather unique construction, however it is fully functional, as it was used as the main ammunition “feeding” mechanism for the artillery guns. At both ends of the bunker, there are metal structures that take the projectiles and raise them vertically, at the gun positions. Each concrete foundation has two vertical metallic ducts. The main bunker is connected with the two secondary chambers of the complex. The first chamber (3 x 7 m) was used exclusively for storing ammunition, as steel rails run through its roof. The second bunker (2 x 7 m) lacks a similar installation on the roof, so it should be of general use. Each secondary bunker has two armored doors. Concrete staircase to the entrance of the bunker complex. Both of these chambers end up in a small anteroom (1 x 5 m), which also serves as a secondary exit. The exit is protected by a heavy armored door, after which a concrete staircase leads to the surface. The six armored steel doors are all “Naval Type”, i.e. removed from decommissioned battleships, probably from “Lemnos” and are found in three different types. One of the armored steel doors. Thickness of concrete is 80 cm. Apart from the door to the secondary exit, all the other doors are very small and the visitor has enter through them very carefully. It is not clear whether the use of such small doors was the result of a lack of large doors or a deliberate choice because of the limited space. 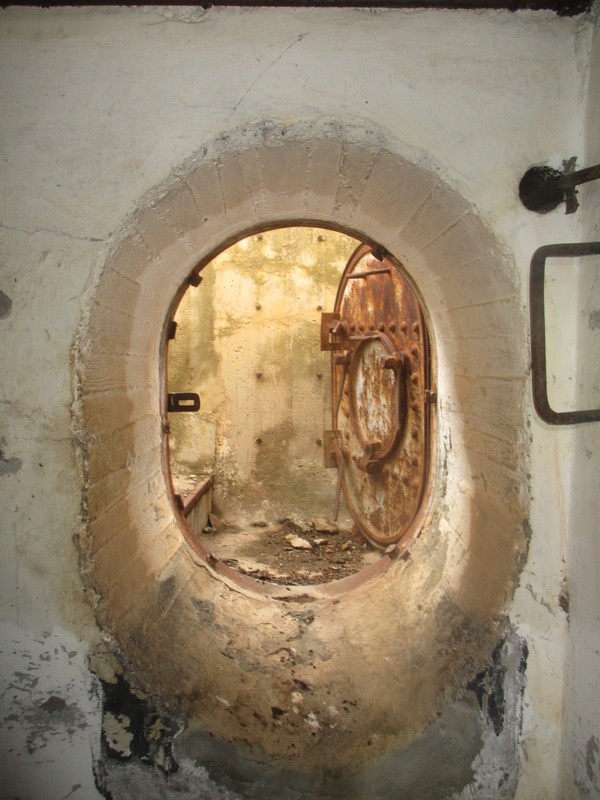 Of particular note is the door that connects the ammo storage room with the central bunker, as it is the only shelter door we have seen in the shape of a shield. The steel doors have a “submarine” feeling, due to their small size. The bunker complex is made of reinforced concrete. The thickness of the walls ranges from 60 cm (internal walls) to 80 cm (outer walls), as the storage of ammunition demanded better protection. The roof is flat and the height varies from 2 to 3 meters, while in most places metallic sheets reinforce the ceilings. The main bunker. At the left the door to the auxiliary bunker, in the foreground the steel stairs and at the right the projectiles mechanism. Air ducts, the ends of which are obvious outside the shelter, are also present between the chambers. Near the main entrance there is a small hydraulic installation. The total area of the shelter is approximately 75 square meters. Some of the bunkers of this type have differences in the arrangement of the entrances and exits, such as the lack of concrete staircases before the main entrance, however, their interior is identical. Detail of one of the projectiles mechanism. This structure was used to carry the heavy ammunition vertically from the bunker to the gun positions on the surface, with an elevator. Today, this bunker is in moderate condition. Concrete does not show signs of strain and moisture οn the walls is limited. The signs of rust are quite evident, not on the armored doors and the steel sheets on the ceilings, but in all electric and projectile lifting mechanisms. Also, some of the metal stairs are corroded. This is the exit point of the projectiles, before being loaded into the 178 mm naval gun. The electrical system is no longer functional, as many parts of it lie on the ground and the same applies to the projectile lifting and loading mechanism. The ammo bunker with rails used to move the projectiles. Inside the shelter there is not much rubbish, but there are several stones, woods, cables and dead birds. At some points on the walls, previous visitors have carved their signatures along with messages. A German from the MAA-603 (Marine Artillerie Abteilung 603), the 603rd Naval Artillery Battery painted this fresco, which survives to this day. Of particular interest are the frescoes painted on the walls by the German soldiers who manned the bunkers after the capitulation of Greece. Another view of the main bunker, with the projectile lifting mechanism and the steel doors leading to the auxiliary bunkers.